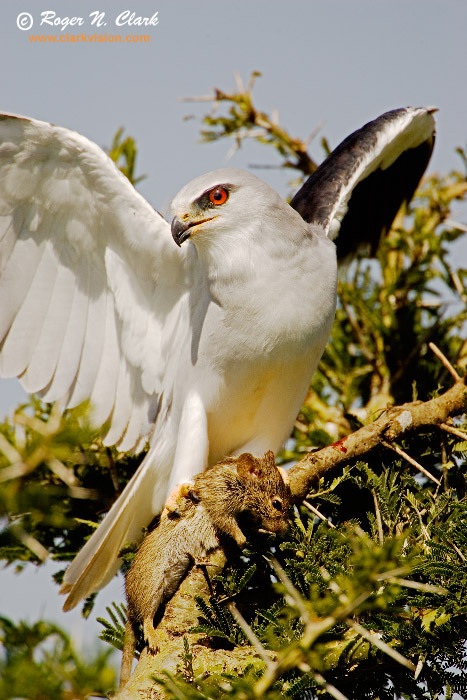 Black-Shouldered Kite, with a mouse. Ngorongoro Caonsrvation Area (NCA) in Tanzania, Africa. Here, the kite is taking off to go eat the mouse mouse in a shady spot. Technical: Canon 1D Mark II 8-megapixel camera, Canon 500 mm f/4 L IS lens plus a 2x teleconverter giving 1,000 mm at f/8. Exposure: 1/1,250 second at ISO 200. Full image, no crop.